Probably you’ve at least heard of it. It seems like everyone is talking about it–the Hulu series about the dystopian future where women with two good ovaries are fated to be surrogates for wives of societal stature who are infertile. For birthmothers this is where the dystopian future meets the dystopia past. Birthmothers have already lived in this world and handed over our children to those that society deemed worthy. I felt this when I read the book in 1989 (while nursing my youngest child,) but watching it come alive on the screen brought a bitterness that I have not tasted for some time. 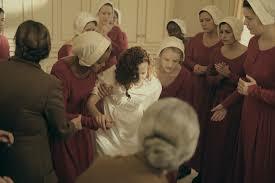 In the story it’s customary for all the handmaids in the neighborhood to attend a birth. While the adoptive mother in waiting lies on a white sheet in a stylish living room, moaning though fake labor pains with the other wives coaching her, upstairs the real labor progresses with the handmaid who is lucky enough to have conceived a child in this toxic future world. When the birth is imminent, the handmaid leaves the luxurious marriage bed for a birthing chair, the privileged wife sitting behind her as if she too is pushing through the labor pains. When the baby is out, it’s the wife who situates herself in bed and receives the baby. The handmaid, (birthmother) is just a few feet away, empty-handed and anguished, longing to hold her child. A sister handmaid turns her face away from the baby and its new mother. Then the entire room of handmaids converge on her, hovering over her, murmuring their comfort. It’s a wrenching scene, but for those of us who were handmaids of the 60s and 70s, we had no compatriots. At the moment of my son’s birth, the intern in the delivery room joyfully asked me if this was my first child. Before I had a chance to utter a syllable, the doctor in charge guffawed. “She’s an unwed mother,” he said. My son was wrapped is a blanket and whisked away. I suspect most of us gave birth that way. No family present. The baby’s father not allowed anywhere near. No murmured comforts anywhere. This entry was posted in adoption, birthmother, birthmothers, grief, Uncategorized and tagged The Handmaid's Tale on May 7, 2017 by declemen.